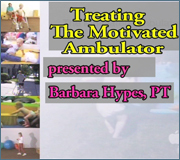 This video presents the facilitation of components of control required for gait in children with neuromotor disorders. Essential components of normal gait, understanding weight shifting, and the determinants of gait are discussed. Treatment sessions with several children with various gait issues are presented with comprehensive analysis of the problems and the intervention strategies.